Back in 1937 the original “Endeavour II” was built in steel at the Nicholson’s Yard and designed by Charles Nicholson. “Endeavour II” was built to battle the J’s in the America’s Cup Race that year, maximizing the waterline to 87ft she challenged “Ranger” but did not beat her. The original Endeavour II was scrapped in 1968. Following the 1989 rebuild of the J-class yacht Endeavour, Dykstra Naval Architects from Amsterdam took on the job to design the replica of this biggest J ever built to date. 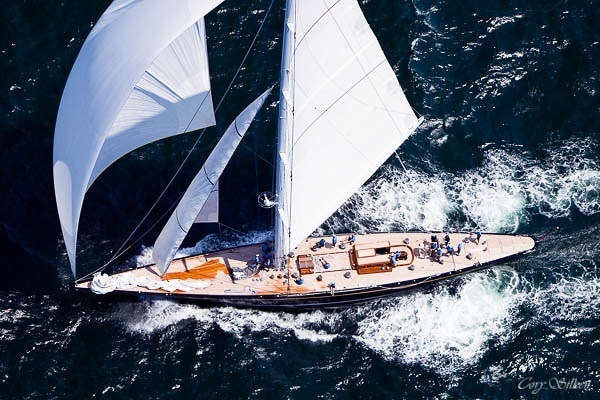 Royal Huisman from Vollenhove was commissioned for a modern recreation of Tommy Sopwith’s beautiful 41.3m/135.5’ “Super-J” class yacht, Endeavour II. Under J-Class Association rules, some design features are restricted historically, but performance can be optimised through a more flexible approach to sail area, ballast ratio, righting moment and build materials. As a result, Dykstra Naval Architects oversaw the build of Endeavour II’s hull in Alustar, with spars and rig in carbon composite to create a yacht that should demonstrate the full potential of Charles E Nicholson’s original design. To further this ambition, Royal Huisman have been working with the naval architects, the independent Carew Group, master sailmakers North Sails and spar makers Rondal to create the optimum mast and sail configuration as, in effect, a single wing unit. Below decks, by contrast, interior designer Pieter Beeldsnijder has drawn upon fine traditional materials such as hand-polished French Walnut and period design references to create all the warmth and ambience of a bygone era, sensitively fused with the high amenity standards of a modern superyacht. There can be little doubt that immense interest was created when Hanuman joined the J-Class racing circuit in 2009.